Using the original artwork that made the pages of the four selected stories come so vividly to life for young readers strengthens the authenticity of the short film adaptations considerable in another fine child’s read-along compilation title from Scholastic. While you can just choose to lose yourself in the stories, in order to help kids work on their reading skills in the guise of watching a movie, the disc relies on the same format made popular in sing-along DVDs or onscreen karaoke. Giving viewers the option to turn on or off the light up text and follow along with the narration as color fills each word makes Scholastic’s Storybook Treasures DVD series an ingenious and invaluable asset of reading is fundamental technology as an inexpensive alternative to overpriced, over-complicated tablets and computers. 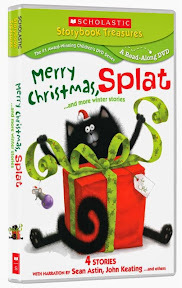 Nicely timed to the holiday season, Merry Christmas, Splat… and More Winter Stories features the eponymous work along with Fletcher and the Snowflake Christmas, Snowflake Bentley and Owl Moon. 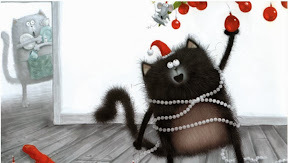 Though Splat is instantly likable in a cartoon character sort of way, the tale of the spoiled cat longing for a really big gift isn’t nearly as narratively appealing as the three stronger stories that follow. We learn about empathy and looking out for your neighbors in the sweet-natured Fletcher and in are treated to a gorgeously rendered historical tale about a young boy who grew up longing to study snowflakes in the Sean Astin narrated standout Bentley. Saving the most poetic tale for last, Owl Moon manages to lose you in the evocative use of language and subtle repetition employed throughout author Jane Yolen’s classic book, which is read aloud by Yolen herself. Light on bonus features save for a brief but fascinating behind-the-scenes tutorial on how the animators brought the images on the page to life onscreen, Splat nonetheless makes up for what it lacks in extras in stellar feature content. A fine stocking stuffer idea, the disc works well both as simply quality entertainment and also to augment home study in linguistics, supplementing school work and helping out busy moms and dads who – particularly in this busy day and age – may not have time to drop everything and read four storybooks in one sitting multiple times a day.